Abstract: The data set contains 15 classes of 24 instances each. Each class references to a hand movement type in LIBRAS (Portuguese name 'LÍngua BRAsileira de Sinais', oficial brazilian signal language). The dataset (movement_libras) contains 15 classes of 24 instances each, where each class references to a hand movement type in LIBRAS. compose the discrete version of the curve F with 45 points. All curves are normalized in the unitary space. 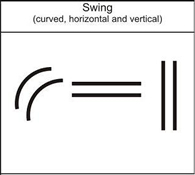 curve F is mapped in a representation with 90 features, with representing the coordinates of movement. Some sub-datasets are offered in order to support comparisons of results. DIAS, D. B.; MADEO, R. C. B.; ROCHA, T.; BÍSCARO, H. H.; PERES, S. M..
Hand Movement Recognition for Brazilian Sign Language: A Study Using Distance-Based Neural Networks. In: 2009 International Joint Conference on Neural Networks, 2009, Atlanta, GA. Proceedings of 2009 International Joint Conference on Neural Networks. Eau Claire, WI, USA : Documation LLC, 2009. p. 697-704. Please refer to the Machine Learning Repository's citation policy.